a classic...always great...something for everyone...can't go wrong. invented back in 1937 at the Hollywood Brown Derby restaurant, it's still stands on it own as a fabulous main-dish salad. especially if there's EXTRA BACON! no real surprises here...no fabulous recipe to report. just an idea and a little shout out for one of the classics that won't let you down when you need something that will fit everyones taste buds. if you have the time it's nice to make everyones plate with all the separate components, or you can do as i did and just make one big impressive platter in all it's Cobb glory. 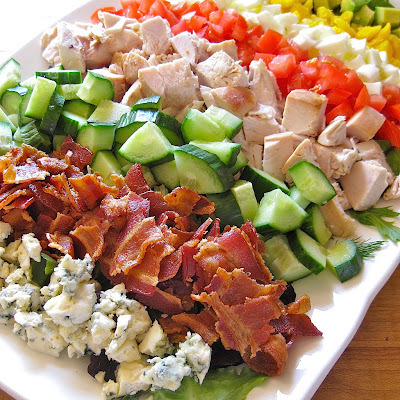 to serve, i dressed the greens in a separate bowl and made up each plate as it went to the table, serving from the main platter...drizzle a little dressing over the top with a little more crumbled blue cheese and put some dressing on the table for those who tend to over-dress. i'm an under-dresser. serve with a fresh crusty baguette OR...some homemade bread. I always forget about the salad and especially this one. It's my husbands favorite and I almost never make it. Ill have to bring this one out in the next few weeks. Yumm...this is my favorite kind of salad, and I order it at restaurants constantly. Beautiful picture!